In a market—if not a world—that can be obsessed with digital technology, industrial stocks can seem like a backwater, especially for short-term traders. Anyone spouting such a line hasn’t been watching the market lately, since industrials have been the S&P 500’s (SPX) fourth-strongest sector so far this year (despite a pullback the past couple of days), and the road & rails industry has returned more than 8% year to date—twice as much as the SPX. High-profile railroad names like Union Pacific (UNP), Norfolk Southern (NSC), Kansas City Southern (KSU), and CSX Corp. (CSX) have chugged higher in recent weeks. 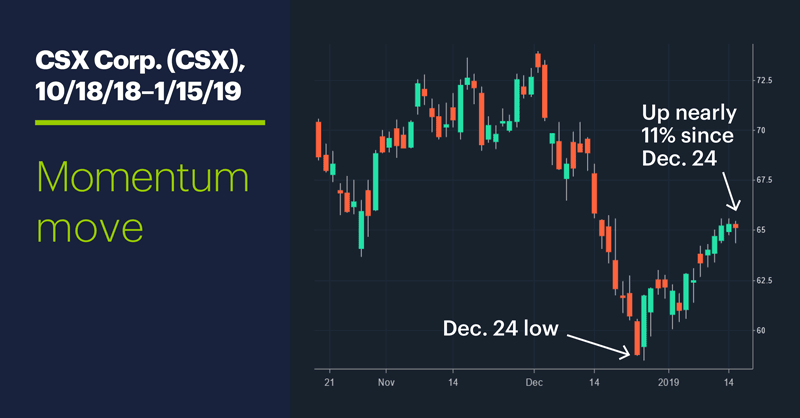 Yesterday, CSX (which is scheduled to release earnings after today’s close) had just its third down day since December 24, and is up more than 10% from that low. In a way, the railroad industry represents the current market-economy conundrum in microcosm—i.e., a stock market that fell sharply in late 2018 despite generally strong economic conditions. Rail companies and their stocks typically perform well in a strong or expanding economy because economic strength translates into more goods riding the rails.1 Hence, given consensus forecasts of continued US economic strength, railroads would be expected to be in a good spot. Last year, though, highlighted the chasms that can sometimes open between stock markets and economic conditions, one way or the other. ●More often than not (55% of the time) CSX closed lower the day before earnings (yesterday). Momentum traders likely noticed the stock, which was down as much as -1.5% yesterday, rallied off its lows to the upper end of its range later in the session. ●CSX usually closed higher (68% of the time), and also closed above the open, on earnings day (today). That last point may play into a scenario that allows for CSX and other railroads to give back some of their recent gains before moving higher, if that is indeed where they’re headed in the long term. Market Mover Update: After climbing a little above the upper boundary of the consolidation noted in “Getting a head start on volatility,” Cigna (CI) jumped more than 2.5% intraday yesterday. Today’s numbers (all times ET): Housing Market Index (10 a.m.), EIA Petroleum Status Report (10 a.m.), Beige Book (2 p.m.). Today’s earnings include: Bank of America (BAC), BlackRock (BLK), BNY Mellon (BK), Comerica (CMA), Goldman Sachs (GS), PNC (PNC), U.S. Bancorp (USB), Alcoa (AA), CSX (CSX), Kinder Morgan (KMI). 1 Zacks.com. Railroad Industry Outlook: Economy Boom to Retain the Upside. 10/4/18. 2 ProgressiveRailroading.com. Outlook 2019: Class I CEOs predict rail traffic growth. December 2018.